Energy infrastructure (commonly called midstream) companies have weathered a string of tough years since the energy commodity price crash of 2015. These were high flying stocks in the decade through 2014, with the master limited partnership (MLP) sector returning an average 18% per year from 2000 through 2014. MLPs were the energy infrastructure/midstream business structure of choice. These companies owned pipelines, storage facilities, loading and unloading terminals. Customers accessed these assets through long-term fee based contracts. MLPs used the fee-based revenues to pay steady, attractive distributions to investors. Growth came from developing new projects, funded with a combination of debt and equity. The energy sector crash blew up the MLP growth model and revealed some ugly features of the typical publicly traded partnership agreement. The last four years have seen a massive restructuring of the companies operating in the energy midstream space. There are now a number of corporations instead of the partnership structure. Balance sheets have been strengthened with companies focusing on using internally generated cash flow to fund growth projects. Onerous features of MLP partnership agreements have been abandoned. While share values have not recovered from the problems of recent years, the financial restructuring is basically completed, and these companies are on the verge of again generating attractive dividend growth and total returns for investors. Here are three stocks from the group that should do very well in 2019. 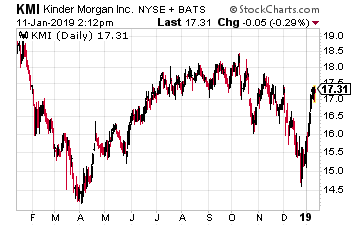 One of the first MLPs, Kinder Morgan Energy Partners launched with a 1997 IPO. For the next 16 year the company provided tremendous returns to investors in the MLP. As the MLP business model stopped generating the expected growth, in 2014, Kinder Morgan Energy Partners was acquired by the corporate sponsor, Kinder Morgan Energy Inc. (NYSE: KMI). 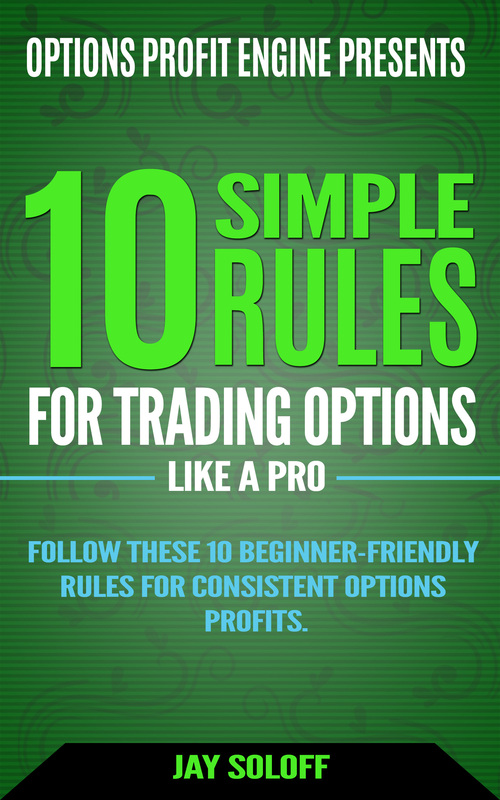 The consolidation was not enough to prevent the carnage of the energy sector crash. In early 2016, the KMI dividend was slashed to $0.125 per quarter from $0.51. The KMI share price fell from $43 in mid-2015 to $12 in January 2016. The stock now trades at $17.40. Over the last three years, the company reduced debt and built cash flow to internally fund growth projects. In April 2018 the dividend was increased by 60% to $0.20 per share. The share price hardly budged. Management has stated the dividend will increase by 25% each year in 2019 and 2020. Free cash flow is currently $2.00 per share and growing, so the $1.25 annual dividend for 2020 is in the bag. 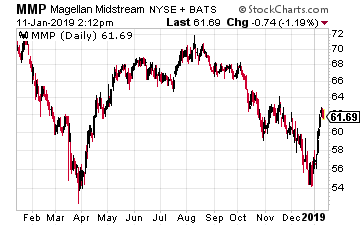 In mid-2015 Magellan Midstream Partners LP (NYSE: MMP) was an $83.50 per unit MLP. The units now trade for $62 and change. Since its 2003 Magellan Midstream did not follow the MLP practice of raising growth capital in the public equity and debt markets. All of Magellan’s growth has been funded through internal cash generation, without the need to tap the equity markets. Despite what the market price shows, the MMP distribution has been increased every quarter, and the current rate is up 42% compared to when it traded for $83. With a 6.25% yield and continued 8% annual distribution growth, MMP could return 20% or more in 2019. 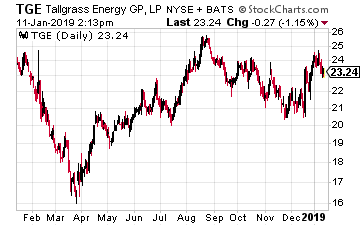 Tallgrass Energy LP (NYSE: TGE) is the result of the 2018 merger of traditional MLP Tallgrass Energy Partners and the publicly traded general partner, Tallgrass Energy GP LP. ­Through its life as a traditional MLP, Tallgrass Energy Partners was one of the top distribution growth companies in the sector. The merger with the general partner eliminates the payments the MLP was paying to the GP. This means lower expenses and more cash to continue the distribution growth record. Tallgrass owns and operates one of the largest crude oil and natural gas pipeline networks in the country. Dividends could grow at a mid-teens per year rate. With a current 8.6% yield, TGE is grossly undervalued and could double in 2019.